A beautiful addition to your storage suite, to serve as an extension of your closet or dresser, our 42" Armoire is sure to have a huge presence on your space. From start to finish, this piece is bench-built to perfection, offering a modern take on classically influenced. antique styles that are sure to look great added to any bedroom. The main feature of this beautiful chest is behind two paneled doors that open to reveal adjustable shelves, a clothes rod, or a TV/DVD stand - depending on which you choose. Below, two spacious, dovetailed drawers are available to hold your clothes, linens, or any other bedroom items, all in one convenient location. 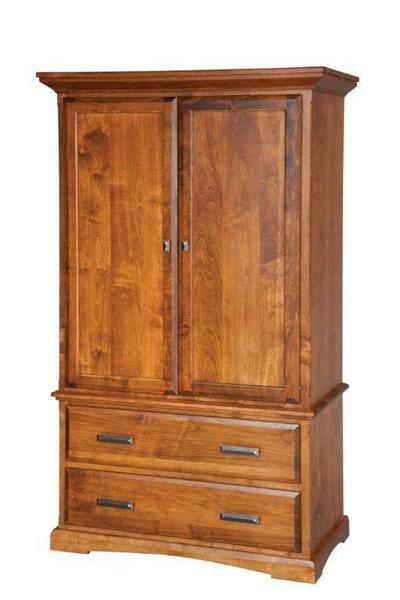 Customize your new armoire with an array of hardwood and finish options to choose from. Finish it off with the standard hardware as shown, or select a different piece to add a touch of personal style to accent this armoire.